I had the surprise of my week (so far) when I was perusing the pages of the Telegraph’s Fashion section online to find that I am including in the PeerIndex list of the top 50 fashion insiders on Twitter! To be included along with fellow fab friend Coco’s Tea Party, as well as the one and only Hilary Alexander, makes it even more special. 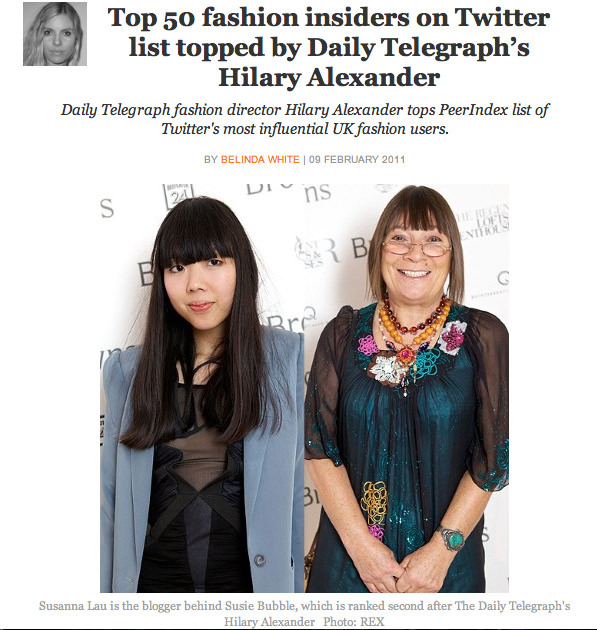 A big, warm thank you Hilary Alexander, Telegraph Fashion and PeerIndex. Find out about Coco’s Tea Party here. Follow Hilary Alexander on Twitter here. In Action… Behind the Scenes of the LeiVanKash Lookbook Shoot! Ohhhhh, snap! Congratulations, beautiful! You deserve it. I recently got on Twitter. I'll pay you to follow me back. Okay, not really. But you will get a glimpse into my awesomeness. It's better than money. That's BIG! I guess congratulations are in order. @Bonnie – thank you hun! haha – welcome to the circus that is Twitter!! @David/the nyanzi report – thank you!! @Jordana – not only pre-Telegraph, pre everything! Toronto, York U, Bordeaux…:)) Thanks hun! !